Our online packages contain comprehensive materials for grades Kindergarten through High School in all subjects. The one month package contains a basic set of questions with an expanded offering in our one year package. The 1-month package we have available has approximately 500 total questions and the 12-month package has about 1,400 total questions per grade level depending on the grade. 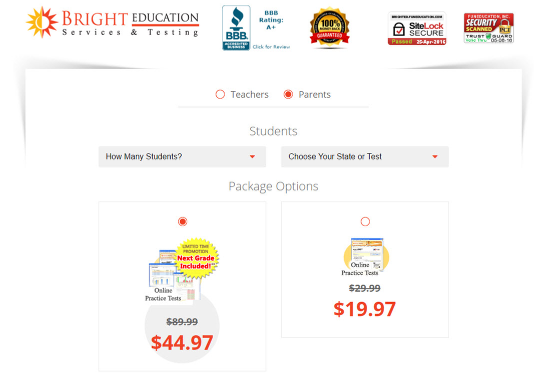 The one year package also includes the National Percentile Comparison chart and report as well as all subject levels which are not in the one month package. We have 2 products, Online Practice Tests and Printable Workbooks. The online practice tests give each student access to an online account where he or she can take tests in his or her particular grade level, have that test scored automatically, and track the results with detailed charts and graphs. The printable workbooks offer you a more traditional printed format. They include practice questions, parent help & information, and the answer keys to each section. You will gain access to view and print pages from or entire workbooks online.